WHEN IT COMES TO TOMATOES, I’m always looking for “new” varieties to try. This year I’ve ordered several heirlooms, including ‘Golden Sunray,’ ‘German Pink,’ and ‘Cherokee Purple’ from Seed Savers Exchange, and ‘Striped Cavern’ (pictured above) from Johnny’s Seeds, the source of the photograph. What other heirlooms or hybrids should I try? Which ones have you grown and loved? In the comments section below, tell me which tomatoes you simply can’t live without. I’d like to put my Solanum lycopersicum order to bed…based on your recommendations! I love any homegrown tomato. Can't wait to make a tomato and mayo sandwich. The only tomato I didn't care for was Mr. Stripey. He was pretty in my garden, but just like most of the men in my past, he was pretty on the outside and tasteless on the inside. Sigh. I love Bloody Butcher, another heirloom. Great flavor, and it ripens earlier than others. I even got a decent crop last year, the worst year for tomatoes. Brigid – Regarding Mr. Stripey, LOL! As for tomato/mayo sandwich…prefer mine on white bread. Eric – I grew Bloody Butcher here a few years ago. Delicious. Thanks for reminding me. I agree with Brigid. Mr. Stripey is all talk. I prefer Big Boys – these indeterminate hybrids really deliver. Kevin, Arkansas Traveler is the best tomato I've ever grown. The fruit is pinkish, and baseball size. I couldn't believe the harvest last August: more than a dozen fruits each day, and all from a single plant. A very big, single plant! No blight problems last year, probably because I gave it plenty of room to grow. Better Boy is a good producer for me. I grow it every summer. I'll have to try Arkansas Traveler this year, based on Janis' review! I must admit that I do not really eat a lot of tomatoes, but I do like the Yellow Pear for snacking on out in the garden with my morning coffee. I also like the potato leafed Brandywine that produces nice sized fruit that I generally grow to give to friends. I also agree with Eric that the Bloody Butcher is a nice early tomato. I grew this one 2 years ago and I liked the color of the fruit which are held in clusters, but I couldn't comment on the flavor as I gave them all away. Last year I also planted Carolina Gold and Black Krim but I cannot comment on the fruit as the blight got them. Janis – I'm putting Arkansas Traveler on my list. Justin – I've grown Better Boy, too. A nice, tasty, reliable tomato — good for everything. Randy – You supplied me with Brandywine tomatoes one year, and they were delicious! Kevin, I think you will love Cherokee Purple. It's my favorite heirloom. Very juicy and tomato-y. Sheila – Thanks for the review of Cherokee Purple. I'm looking forward to this one! 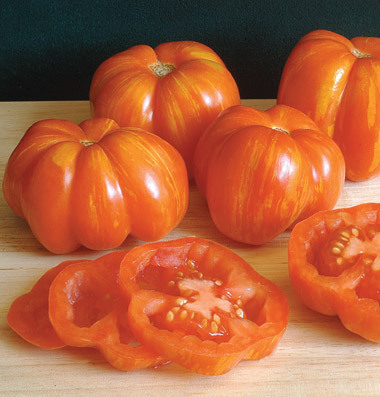 What do you think of Burpee's “Seedless” Tomatoes? James – I have not tried Burpee's new seedless tomato. I'm with Brigid, any homegrown tomato! Skip the cherry toms, too bland for me. I go crazy with Better Boy. Basically, any producer of big, fat, juicy, flavorful toms that are great eaten fresh out of the garden or fry up nicely as green tomatoes when we just can't wait. Anonymous – no cherry tomatoes for me, either. I find that Better Boy and other large hybrids perfect for frying at the green stage. The best tasting tomato I've had in decades is Improved Gurney Girl. I've planted it this year and last, and they are VERY prolific, and so delicious. 6 plants last year in my organic garden produced over 500 tomatoes! I reduced that number to four plants this year, and still have hundreds more than we can eat. I haven't finished the count yet. The best tasting cherry tomato I've found is Sun Gold. It, too, is very prolific. I have one plant, and hundreds of cherry tomatoes. The sweetest I've ever tasted. I go for flavor in all plants in my raised bed garden now. I have no room for mediocre vegetables. Diane – thanks for the update. Will have to order Gurney Girl next year. Are you preserving your tomatoes, and if so…how?